My current favorite is the Joues Contraste blush - In Love from Chanel. This is one of the more pigmented blushes I have seen with Chanel. I saw the SA wearing it once, and it really looked like she had overdosed on Fanta, but there was something very cute about the colour, and I picked this up right away. As with all Chanel powder products, this blush too comes in the signature black fingerprint-magnet glossy case with its own lint-magnet velvet pouch. These things really are meant for posher homes than mine! A brush is included with the Chanel Joues Contraste blushes, and though a true makeup lover would scoff at using these, I am perfectly okay with it. It's decently soft, quite unlike their earlier scratchy brushes, and I haven't yet bought the blush brush of my dreams, so I am willing to compromise. The Chanel Joues Contraste In Love is a darkish coral-orange blush with a bit of pink in it - that's how it looks to me in the pan. There is very fine shimmer in the blush, but it doesn't show up that obvious on swatches or the face. Instead, all you see is a bit of a glow which I love. There is a mild rose fragrance that is a common feature with Chanel blushes and powders. It's a mild fragrance, and it never bothers me - in fact, I quite like it. If you prefer your makeup unscented, though, this might be an issue. 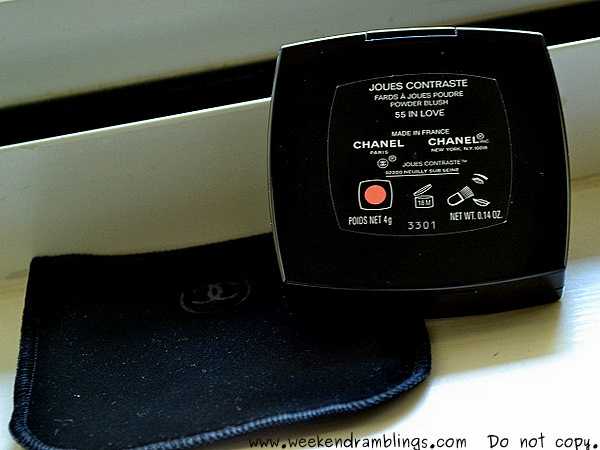 How to Use (from the Chanel website): Joues Contraste offers effects from very natural to very sophisticated. Used as a simple touch of colour, it gives your complexion a healthy glow. As a professional tool, it shapes and models your face (cheekbones, browbones, forehead, chin, along the nose). Because I am darker skinned, it gives a subtle bronzed look. It's the perfect colour for me since I haven't yet learned how to use darker/bolder blushes but still want a bit of colour to show through. The Chanel In Love blush may not show up that well, though, on someone darker than I am. It stays about 5 hours on me, which I think is pretty good considering I don't use a primer and most times stick to either a powder foundation or just powder. Cost: $43.00 (Rs. 2400, thanks Rati for the update). Yayyy, first to comment. Rads, this blush looks just lovely on you and you looking very pretty. Hehe, you like colourful bags? BTW, just replied to your emails. Your skin is really glowing, you still using Shiseido skin care range? Cannot open my mail right now, some error, so will try bit later. Is Lush Dream Cream OK for oily skin? Sabrina - Nooo...it's quite dry here, which is why I am happy with this. It's okay for oily-combination skin types, but from what you have told me, I think it would be too heavy a cream for you. Abi - Oh I am quite dark myself, I don't even know if that 42 thing is correct but anyway that's what the SA told me..so me put it there for a reference kind. It is quite expensive, but you could always look for an orange-based blush in other brands like NYX - I love the MaxFactor reddish-orange cream blush and that would suit most darker skin tones. Oh yea, its nice! going through your old posts now. Got lots to catch up on :)... when did you move to US? Some time back, Laksh...about 3 weeks now...but I might be back next week in India..never know! Haaaa you liked it? :D Oh you will be back in India...permanently or vacation? amazing shade rads..loved it !! Not a vacation but not sure about the permanent status yet!, but I am not gonna complain, missing home a lot! Ritika - Heyyy how are you?? Busssssyyyyyyy bussssyyyyyyyyyyyy kya? I think you are getting too conscious of the usage of your camera because of certain reasons *coughh*. Jomolayyy but you like bright colours, dont you??? If not, then you return those Lotus colours you fought and forced and took from me!!!!!!!!!!! RIGHT NOW...send them back!!!! It so suits you. I seldom wore blushes either, mainly cos I didn't know where to place it as I have exaggerated cheekbones and chin! But now I do use it. It is a gorgeous colour... and I think I am pretty much the same skintone as you. Blush suits you very well..
New template rads? It looks good... but not as good as the blush.... which is absolutely awesome....! the colour reminds me of MAC msf stereo rose... they may be totally different, but i am reminded of that... so what lippie are you wearing? Aarthi - try it some time if you are at the counter, am sure you will love it too.